On June 6, 2012, our lives were changed forever. Not only were we blessed to become parents, but our vision of what parenthood would look like was completely changed. Mark was born with Tracheoesophageal Fistula and Esophageal Atresia (TEF/EA). This meant, his esophagus from his mouth ended in a pouch and his esophagus from his stomach came up and attached to his trachea. Mark was taken by ambulance to London Children’s Hospital and we followed as soon as we could. We were able to see Mark for just a few minutes before he was taken to the Operating Room for his first surgery. A couple of weeks later Mark developed Phyloric Stenosis which was completely unrelated to his TEF/EA. Phyloric Stenosis prevented his stomach from emptying and destroyed the TEF/EA repair site. As a result Mark was very sick, and we heard those words that no parent should ever have to hear, the words that literally take your breath away, “he might not make it.” Thankfully, Mark recovered but needed to have his esophagus and trachea repaired again. After almost six months under the very capable care of doctors in London, Mark was transferred to Sick Kids in Toronto. Just before Christmas 2012, Mark had a very intense surgery where scar tissue connecting his trachea and esophagus was removed, and then repair to both organs was needed. The surgery went as planned but the recovery has been lengthy and complex. After spending Christmas in the ICU, Mark grew stronger and we were able to take our little boy home at the age of 8 months. Those first 8 months were the most difficult for Mark. We learned so many things. Many good things such as how thankful we are to live in a country that has covered health care and how many doctors, nurses, and other professionals really care about their jobs and their patients. We learned a lot more than we ever thought we would need to know about anatomy, feeding tubes, lung care, suction machines, travelling oxygen, affects of pneumonia, names of antibiotics, different anesthesia methods, and so on. We know what it feels like to be called into the ICU in the middle of the night, we understand the fear of a "code pink" being called on your own child, we have seen our son struggle to breathe, and struggle through so much pain. And yet, all of that has made him who he is today. Since then Mark has had more surgeries, many more procedures, multiple tests and too many doctors appointments than we can count. The motto for TEF/EA is "fixed but never healed". The TEF/EA is repaired with surgery but there are lifelong complications. Since his first year was extra complicated, he will face many challenges his whole life. Mark was also diagnosed with GERD and has had surgery to help with this. Medication controls reflux but it often flares up and he will be reliant on those medications for life. He has Tracheomalacia, a floppy trachea which gives Mark a very unique cough. The Tracheomalacia also means he has a difficult time with secretions and mucous, which can lead to pneumonia 2-4 times a year. He has zero motility in his esophagus and his stomach causing digestion challenges and severe oral aversion that he is reliant on his G-Tube for all his nutrition. He is receiving some oral aversion therapy through McMaster hospital. 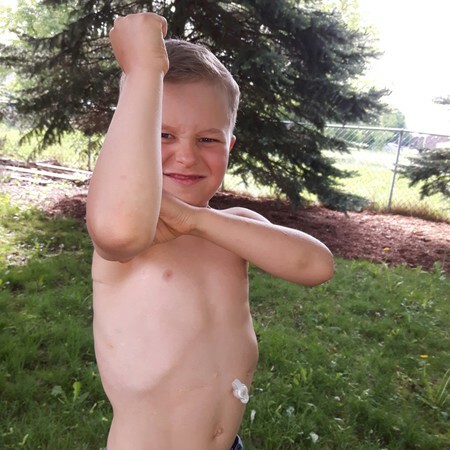 Even though we promote a 'normal' child hood with his feeding tube and all his health challenges, Mark is starting to see more and more that his is not the same as his friends. He worries about and understands things that a 6 year old should not have to such as procedures and the complications that come along with them. Mark has become more responsible. He will confirm that we have his medications when we leave the house for a meal, he makes sure we have packed his syringes for food, he helps prepare his food in the blender. All these things are just a part of who he is, how he was created and how he has grown. He knows he is loved beyond measure, and the life he leads is just the way it is. He takes it all in stride. And we just live in gratitude that we have our Little Miracle with us; that we have him to hug, we can hear him laugh and sing, we can watch him run and play. His two little sisters have a wonderful and slightly overprotective big brother whom they adore. Yes, we know what it feels like to be told that our child might not make it, but we also know what it feels like to be so very, very, grateful for things we have. We have yet to use our wish from Guelph Wish Fund for Children. But it is so wonderful to see Mark’s eyes light up when we think of and talk about all the possibilities! It is so amazing for him to have something so positive and exciting, something that is a part of his special and unique journey.